Protesters gather outside the White House in Washington, June 1, 2017, to protest President Donald Trump's decision to withdraw the United States from the Paris climate change accord. The U.S. Environmental Protection Agency added eight members on Thursday to its scientific advisory board tasked with providing independent input for agency policy, a list that includes at least one vocal climate-change doubter. Those views place him outside the mainstream scientific consensus, including from U.S. federal agencies, that global warming will have devastating consequences if not urgently addressed. But they dovetail with President Donald Trump's policy of rolling back Obama-era climate-change regulations to free up more drilling and mining. 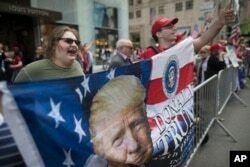 Trump supporters hold a counter rally during "100 Days of Failure" protest and march, Saturday, April 29, 2017, in New York. Thousands of people across the U.S. are marching on President Donald Trump's hundredth day in office to demand action on climate change.